Tonika Wright, a lifelong Austin resident, almost lost her life to the opioid fentanyl. But she’s not the only one whose life has been affected by opiods. The community has as well, she says. To save lives, Wright says one immediate solution is carrying naloxone, the opioid blocker that can save the life of someone who’s overdosed. Late last month, Austin residents met at Austin Town Hall to discuss the opioid overdose epidemic and to also receive doses of naloxone. Local and national speakers attended the program designed to help destigmatize drug users, discuss what to do when someone is overdosing and underscore the disparity in how the media has been covering the epidemic. 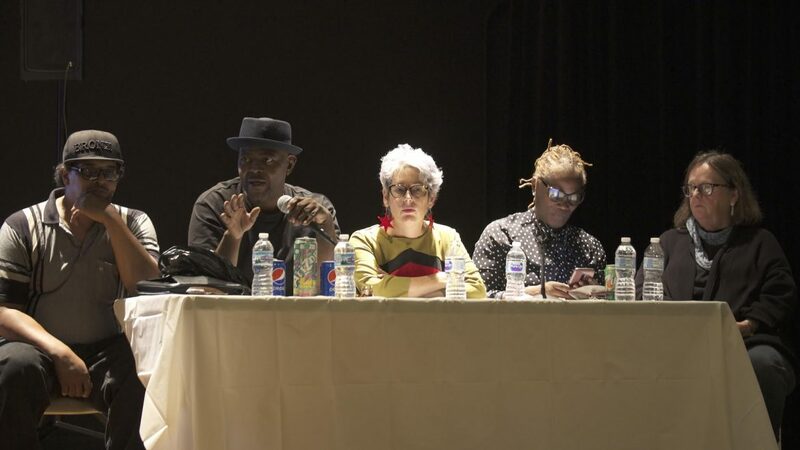 The panel discussion included Kathie Kane-Willis, director of policy and advocacy at the Chicago Urban League; Hiawatha Collins, Harm Reduction Coalition’s harm reduction community mobilization coordinator; and Robert Suarez, co-chairman of the Peer Network of New York. “We do these types of events for underscoring and stressing resilience, solidarity, power, justice and harm reduction,” said Greg Scott, panel facilitator and director at Social Science Research Center at DePaul University. It should be administered if someone is showing signs of overdose, which include unresponsiveness, stopped breathing, lips and fingernails changing color, and/or paling skin. The medication can be shot into a person’s leg or arm. Then chest compressions must be performed to allow the person to breath. The medication also comes in a nasal spray. Kane-Willis, who co-wrote “Whitewashed: The African American Opioid Epidemic,” said despite the number of African-American deaths greatly increasing, the media’s focus continues to be largely on white people. In 2016, African Americans made up 23.6 percent of total fatal overdoses in Illinois, according to the Illinois Department of Health, an increase from 18.5 percent in 2013. In Chicago in 2016, African Americans suffered fatal overdoses at the rate of 39.3 overdoses per 100,000 people, according to a report by the city of Chicago. The rate was lower for whites: 25.1 per 100,000 people. “A form of genocide is taking place across our country, and it’s also happening right here in Chicago,” Suarez said. There is a need for community members to come together to combat the epidemic, Suarez said. Small things can halt the epidemic, such as carrying naloxone, attending events like the one held at Austin Town Hall and treating drug users as people, he added. Everyday citizens can play an important role because often they are closer to an individual at the time of the overdose then a police officer, Suarez said. Destigmatizing the issue will bring residents together and increase awareness, Collins said. Naloxone is available for purchase at CVS. The Chicago Recovery Alliance offers outreach programs as well with addiction treatment and safe consumption products. The Heroin Task Force will hold a town hall meeting Oct. 26 at Loretto Hospital.